The windfarm, famous for annoying Donald Trump as he said it would spoil the view from his badly-sited environmentally destructive golf resort, only came online on 1st July 2018. 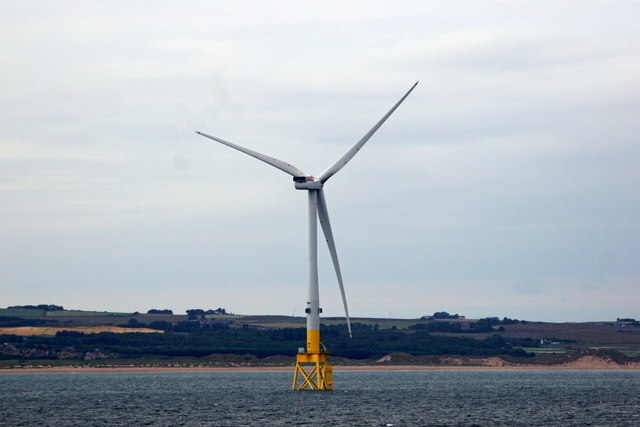 The site of the turbine (NJ9913) is estimated with reasonable accuracy from a map on the Link website and the photo was taken from the Shetland ferry MV Hjaltland in NK0010 (verified by GPS). © Copyright Mike Pennington and licensed for reuse under this Creative Commons Licence.